"I am so sorry to hear about the passing of Mrs. Guntz. I..."
"Our family prayers are with you Uncle Mel/Godfather and..."
"One of my favorite teachers back in the early 1990's. 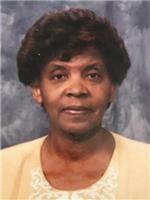 She..."
"To the family of Mrs Mable Guntz you are and will be in my..."
Mable Jean Thomas Guntz, a resident of Baton Rouge and native of Denham Springs, passed away on Tuesday, April 9, 2019 at the age of 79. Mrs. Guntz was a retired educator and athletic coach who taught for over 30 years in the Livingston Parish School System including making history integrating the Denham Springs High School faculty during the 1969-1970 school year. She was a graduate of West Livingston High School in Denham Springs and Southern University A&M College earning a B.S. in Physical Education and a M.Ed in Secondary Education. She leaves to cherish her memory her husband of 51 years, Milburn Guntz, sister Johnny Mae Jackson, daughter Maya Lucille Guntz, four grandchildren (McKinlee Jean Flowers, Madison Jai Flowers, Mason James Flowers, and Roman Bates V), and a host of other relatives and friends. A celebration of life will be held on Thursday, April 18, 2019 at MJR Friendly Service Funeral Homes in Denham Springs, LA at 12:00p.m. Interment will be at the Louisiana National Cemetery at Port Hudson. Arrangements entrusted to MJR Friendly Service Funeral Home, Denham Springs.